There are many reasons why forest fires happen, and they do plenty of harm not only to humans, but the animals living in that area would have lost their natural habitats as well while others that are trapped end up as burnt roast. As the good doctor always said, prevention is better than cure. But how does one go about monitoring the vast expanse of a forest while being efficient at it? The answer could lie in robots and not humans. 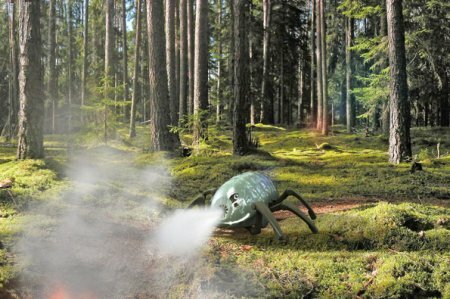 At Magdeburg-Stendal FH researchers are working hard on fire fighting beetles that are more than capable of working their way through the uneven jungle terrain with ease, thanks to the help of half a dozen highly flexible legs. This fire fighting beetle has been dubbed the OLE, and you can read more about it after the jump. The OLE was specially designed to extinguish fires that are still in their infancy to prevent major disasters such as a huge forest fire, which by then the best us humans can do would be contain it while praying for rain to help snuff it out. OLE is capable of monitoring large areas within a forest thanks to the inclusion of infrared and biosensors integrated within. These improvisations enable it to discover fire sources and sending a report back to headquarters while attempting to snuff out these newly discovered fires. The OLE was specially designed to model after the pill millipede – an insect that hails from the centipede family. Taking its cue from its natural inspiration, OLE is smart enough to roll up into an impervious ball whenever danger looms on the horizon, retracting all six legs as well. The heat resistant shell helps it sit through the blazing inferno. Material used to construct the shell is a ceramic-fibre compound that has proven itself to withstand temperatures of up to 1,300 degrees centigrade, providing ample protection to the sensitive electronics within. A couple of mechanical feelers help the OLE negotiate its way through uneven and even difficult terrain with ease, reaching the starting point of the fire within a short period of time. It has a speed that varies between 10 to 20kmh, depending on the terrain. An area measuring 7,000 square kilometers require just 30 of these robots. Sounds a whole lot more affordable than maintaining human outposts. Nice, how fast is 10-20 km/h in miles/h? Only problem with preventing forest fires is that is has been proven that some are actually good. There are some trees that drop very well protected seeds, and they only really break open during extreme heat – like that in a forest fire. While yes, preventing unnatural forest fires is good; believe it or not, some have to be allowed to happen.